In my 20's, I taught myself to code and I created what has become a fairly popular community for sports autograph collectors - SportsCollectors.Net. I have mentioned it a few times before on this blog. 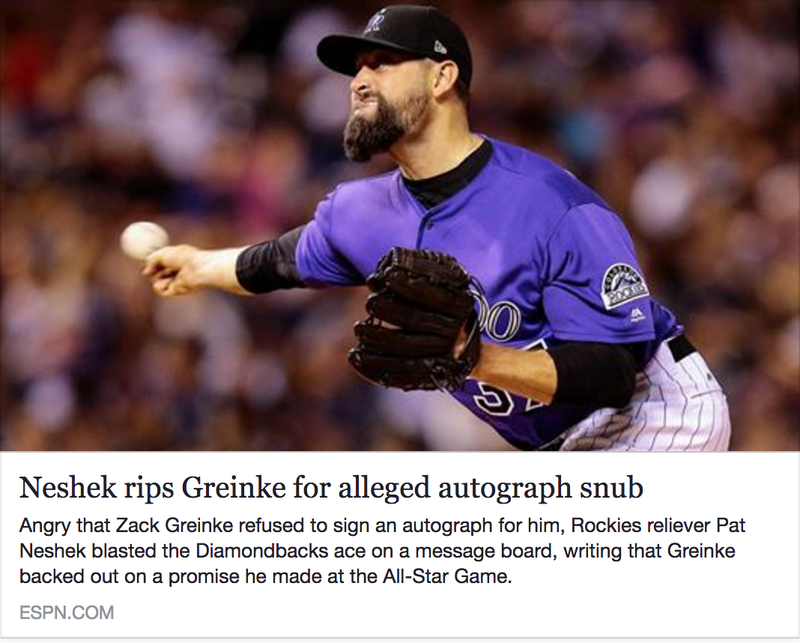 There is a really passionate collector who also happens to be a Major League baseball player named Pat Neshek. Pat is a really effective middle reliever and made his second All Star game this season. He is also known as one of the most generous players of giving his time and autograph to those who ask, and has even helped organize his teammates to answer their fan mail. I was pretty amazed when Pat joined SportsCollectors.Net in 2014 and introduced himself to the community. I know he has traded autographed items with some of the site's members. Here is an article of his collecting interests from a few years ago. So Pat is trying to get all the cards signed from a particular car set for his 3 year old son Hoyt (some are shown below). One of the cards he wanted to get signed featured Diamondbacks pitcher Zach Greinke, who would be his teammate at the All Star game. It is very common for players to sign items for each other, as former Yankee Mark Teixeira talks about Jeter signing hundreds of items for other players/coaches. So Zach promised he would sign the items for Pat the next time they saw each other, and then decided not to follow through. Pat posted his account of the incident on the site's message board yesterday. Once on ESPN, the story got coverage on so many outlets - Yahoo, DeadSpin, CBS Sports, NY Post, BleacherReport, USA Today, Sporting News. And was a topic of many sports talk TV and radio shows. It is amazing to hear this story being discussed on Mike and Mike as I type this, but it also shows how much people are looking to promote sensational things over real sports stories. Mike Golic is on completely Pat's side, players should just sign things for other players. I am hoping another collector (maybe a SportsCollectors.Net member) is able to help Pat get his cards signed and there is a happy ending to the story.